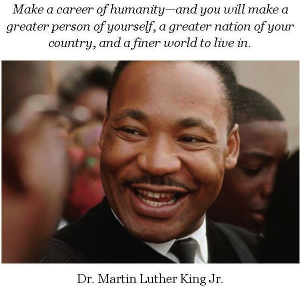 Thank you, Dr. Martin Luther King Jr., for leading the way. You said it best. HOW ARE YOU MAKING A CAREER OF HUMANITY? Social Justice: A Woman’s Place analyzes structural social inequalities in order to promote justice. One Response to In Honor of Dr. Martin Luther King Jr. Thanks Ify! One of my favorite quotes by Martin Luther King, Jr.
“Our lives begin to end the day we become silent about things that matter.” I feel by not being silent myself I am encouraging others to live a full, wonderful life!